curve designated as step 2. The barrel travel which would result from this velocity is shown bv the curve designated as step 3. Step 4 is performed by the same method as for the holt return motion and the modified curves are designated as step 5. 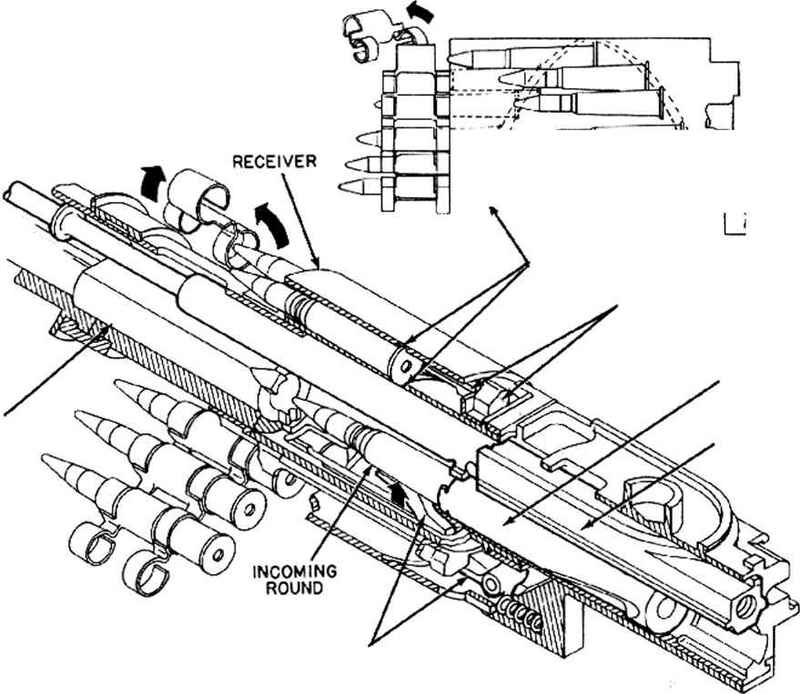 The change in the travel curvc is so slight that it is not necessary to perform step 6 and therefore the curves designated as step 5 represent the effect of the barrel return spring on the barrel motion. Since the bolt is latched at a displacement of 0.156 foot and is required to move forward to a displacement of 0.135 fool, the required movement is . 156 - . 135=.0208 foot. The curves in fig. 2-33 show that this movement is accomplished in 0.0086 second from the time of unlatching. It has already been specified that the barrel must reach the displacement of 0.135 foot at the instant the bolt reaches a displacement of 0.280 foot, which occurs at 0.0396 second, and therefore the barrel must be unlatched 0.0086 second before this time, or at 0.310 second. The data in fig. 2-33 are used to complete the barrel return motion curves up to 0.0396 second.